Whether it’s a group celebration, a family gathering, or a business outing, we have the boat to fit your needs and the crew to help your excursion be one of your favorite memories. As you prepare for your next getaway, discover all that group charters in Miami can do for you. Exploring the wonders of Miami's exquisite coastline may seem off-limits when you do not own a boat or possess the know-how to operate one. Booking professional charters solves that problem and opens a host of possibilities for you to explore throughout South Florida's deep-blue waters. Bachelor Party Charters - Take a unique approach to traditional celebrations and book the bachelor a party that will not be forgotten. Sharing this private adventure with close friends and family is sure to bring a day of laughter, excitement, and pure elation. With a crew and captain to take care of all the necessities, everyone can relax and focus on having the best party ever. Family Charters - Get the family together and head out to sea for a day of fishing and relaxing. Private charters can accommodate the individual skill levels in your family and assist those who need a little help landing their first catch. Bring the generations together to participate in new challenges and accomplishments for a bonding event enhanced even more by the salty ocean breeze. Corporate Charters - Pack up the office and take the group out for a day in nature. Fishing charters are an excellent tool for team-building, putting co-workers in a different environment, and aiding in a change of perspective. Additionally, reward your company's top performers with a charter where they can relax and leave their work attire at home. Gather the group and sail away from the busy highways and crowded attractions on land. Revel in the freedom of designing an outing that reflects your party, and leave the rest to the professional charter company. No matter which charter boat your group embarks on, there is ample room for the gear and the passengers. Move about and take in the beauty that surrounds you from all angles, or sit back and relax to rhythms of the boat and sea. Safe, secure, and operated by our skilled crew, the only concern your group will have is savoring the time away from land and comparing your catch-of-the-day. You can choose from one of our two U.S. Coast Guard certified vessels. Whether you choose our 57' luxury sport fishing machine or our 40' trophy fishing machine, you get one of the best fishing captains in South Florida and our legendary Marlin magic sounders that attract large amounts of prey under our boats by using a low sound system. All bait, tackle, gear, and licenses are included. This charter boat beauty comes with all the bells and whistles. Fish in comfort with ac and a clean bathroom. Don't let the luxury fool you though, this boat is designed to go offshore trolling and has all the technology to ensure a busy day of reeling in sport fish. This vessel is used to drift over the live coral and reef in depths of 45' to 180' to catch giant grouper, snappers, kingfish and so much more. Expect to catch a giant trophy fish to put on the wall in your office or home. When you choose to take a group charter, you are giving everyone a chance to leave their stress behind. 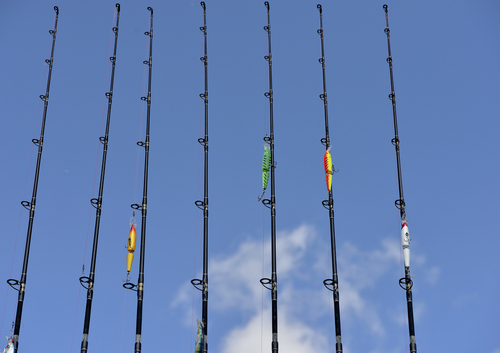 Professional charters provide everything you need to reap the benefits of having experts behind the helm, stocking equipment, and helping the fish find your line. No one in your group needs to worry about packing the right supplies and tools for a successful day at sea. Instead, show up and let the experienced guides ready you for a satisfying and comfortable journey. As you prepare for your group charters in Miami, you should expect a high level of customer service and great attention to detail. You deserve an experience of a lifetime from a quality crew, and that is what you will receive from the moment you make the reservations to the moment you head back home. 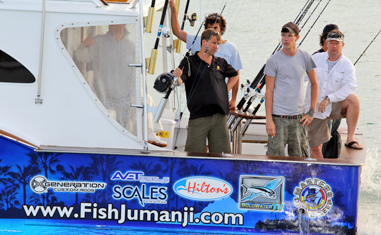 Our professional team at Jumanji Attractions is devoted to ensuring you and your group encounter the highest quality of customer service and experience all the wonders and beauty that South Florida has to offer. Contact Jumanji Attractions today and let us help you book a group charter that is sure to be the highlight of your trip to Miami.